You may have read my Mummy & Me post the other day where I said that I wanted to spend more time with the girls before Baby boy arrives. There are so many thing I want to do before Baby boy arrives in July. More than likely I will be induced either a few days or a couple of weeks before my original due date the 25th. So I would like to complete my plans by the end of June, so I get some time to rest before he arrives. 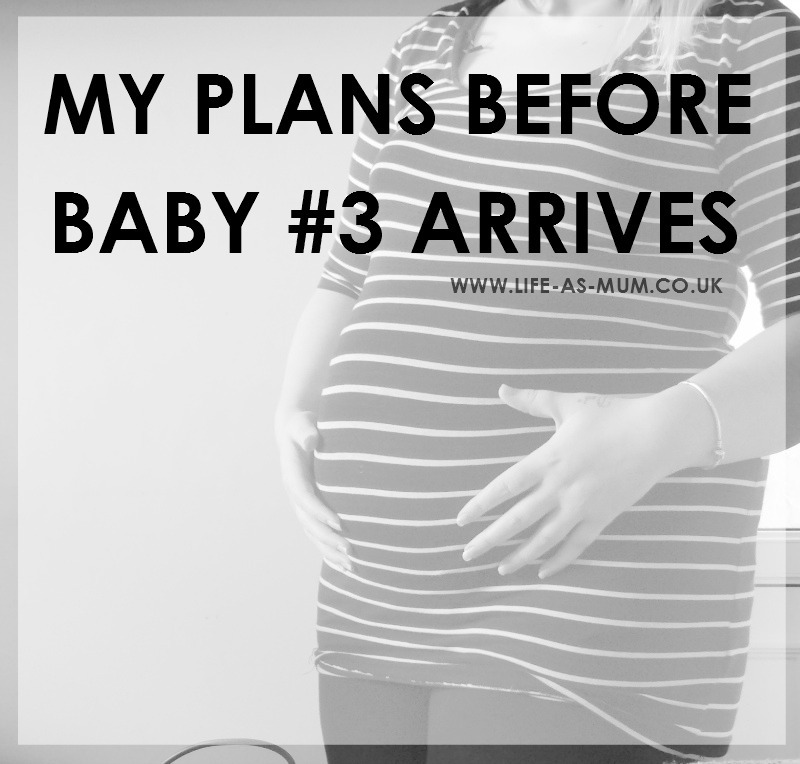 As excited I am to meet him, a newborn can take up so much time and especially that I am going to be breastfeeding for the first time and I have heard it can take a good few weeks for Baby and myself to get used to. Schedule Posts - At the end of May and during June, I am planning to try my best to write as many posts as I can and to schedule these posts during July and August so I won't have much blog work to do. Only the social media side, but I am also hoping to try and schedule those posts too. We will see how well I do in the next few months! Crossing fingers I can do it. Spend Time With The Girls - I mentioned in my latest Mummy & Me post that I really want to spend more days out with both girls before Baby boy arrives. I want to make a lot of memories before we start making new ones with the new addition. They are growing too quickly for my liking, so I am going to try my best to enjoy every single second. Sort The House Out - There are many things that need doing to the house before Baby boy arrives and my partner and I are really determined to do it all before the end of June. We are starting to decorate and paint the girls room this Friday and move both girls into one room (should be fun!). We are then going to paint Baby boy's room and start moving his things in there slowly. We have our bedroom to move around to make room for the moses basket, aswell as re-painting and sorting the living room and kitchen out too. Lastly, we are planning to make the front room like a second living room, but that may take a little longer than every where else! I hope we can do it all in time. Loose Half a Stone - I would really like to say that I have lost weight once Baby arrives but I really can't see it up to now. I need to step up and a kick in the backside to get my healthy eating lifestyle back on track. I can feel the weight creeping on slowly every week and it is making me feel low. Seeing as the weather is picking up a lot more recently, I am looking forward to walking more! I just hope I can stick to it. Date Night - I really hope that me and my partner can have one or two date nights before Baby boy arrives. It would do us good as we won't have it for a good few months after Baby arrives. I think date nights are always a great idea. The last time we had a Date night was when we went to Birmingham to review Travelodge. Did you have any plans before you gave birth? It is becoming more important to plan your baby. More and more couples are interested to know about their baby which will prepare themselves to the biggest joy in their lives. When a baby is expected the family is excited, slightly anxious and a lot of excitement all around.